Nepal climbed to the top of the WCL Division Three table with a 10-run win (D/L method) over United States of America in a rain-hit game on Tuesday. Chasing 224, Nepal had lost opener Naresh Budayair in the first over but Subash Khakurel and Gyanendra Malla strung together a slow partnership of 72 runs in the next 21 overs before rain interrupted play. With the target revised to 64, Nepal were nine runs ahead with Khakurel unbeaten on 49 off 82 balls. Earlier, a fifty from Fahad Babar had anchored USA after quick wickets threatened to negate a solid opening stand between Babar and Steven Taylor. Timil Patel's 39 and a quick 27 from Muhammad Ghous lifted the side to 223 for 9 in 50 overs. Left-arm spinner Shakti Gauchan was the most successful bowler for Nepal with figures of 3 for 30 while Sagar Pun and Basant Regmi chipped in with two wickets each. Nepal coach Pubudu Dassanayake said leading the table was not their only priority. "We are really confident now, because our net run-rate is very high," he said. "But from now on, we want to win each game. It's not about leading the table, we want to win the final as well. The guys are really pumped, and they're looking forward to two good days." A four-wicket haul from Selladore Vijayakumar and returns of 3 for 17 from Abhiraj Singh set up a shaky three-wicket win for Singapore against Bermuda in Selangor. 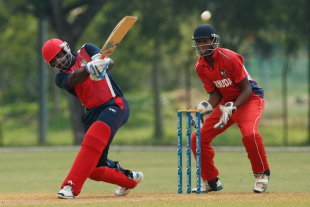 Singapore's bowlers led by Abhiraj and Vijayakumar skittled Bermuda out for 124, with the best batting contribution coming from Kamau Leverock, who scored 28. Singapore, however, made heavy weather of the 125-run chase, losing seven wickets along the way. They were propelled early on by a brisk fifty from Chaminda Ruwan - he scored 57 of the side's first 87 runs by the time he was dismissed - but they stumbled as the chase progressed. Leverock inflicted the most damage, taking 3 for 16 in five overs. Despite the win, Singapore captain Saad Janjua said they had a lot of work to do. "We came with a different type of approach and didn't quite execute it," he said. "I am pleased to have won two matches out of the four we've played, but there are a lot of things to work on for tomorrow's match. I am looking forward to tomorrow, but we need to improve. I am sure we will do that."